Affordable wedding photography in Charlottesville, Virginia captures this blended family wedding and this adorable family photograph moment during the vows of a wedding. Candid wedding photography or photojournalistic photography style during a wedding produces some of the most compelling images of the day. 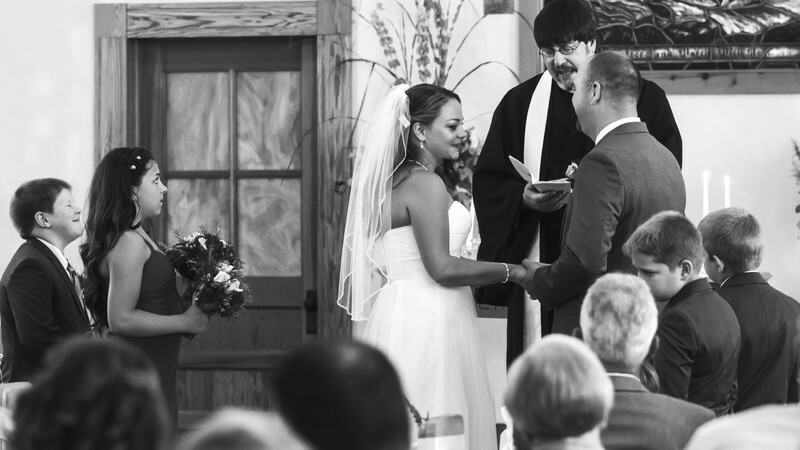 Wedding photography packages don't have to be out of reach for the average person, and whatever the price, wedding pictures such as this one at Fairview Christian Church in Madison Virginia, are priceless, to live on as a historical record for the family for generations to come. The best wedding photos are often the ones that happen spontaneously such as this one where the son of the bride provides the sweetest expression during the ceremony. The best wedding photographers will be alert enough to catch the moments between the moments that live on forever and are remembered and celebrated for years to come. These wedding images were captured with a professional camera gear by Canon, a Canon 7D and a Canon 70-200mm f/2.8L lens. Settings for photographers ISO 1250 at 105mm with an aperture of 2.8 and a shutter speed of 1/125th of a second. Post processed in Adobe Photoshop and Adobe Lightroom, and finished and converted to Black and White in Alien Skin Exposures. Location: 1893 Wolftown Hood Rd Madison, Virginia 22723. Keywords: AG Errica Wedding (3).